Ashida Kim is one of a handful of men in the world who have learned the true art of Ninjitsu, the Silent Way of stealth and assassination in feudal Japan. Initial attempts to bring these secrets to the public were met with stiff resistance due to the brutal nature and terrifying effectiveness of the techniques. Now, some thirty years later, it has become a martial art classic. The Ninja can fight or disappear. Looked for, cannot be seen, listened for, cannot be heard, felt for, cannot be touched. Now, you too can become a master of invisibility with the ability to penetrate anywhere unseen and vanish without leaving a trace. This is a cheap "knock-off" version! NOT WRITTEN BY ASHIDA KIM! 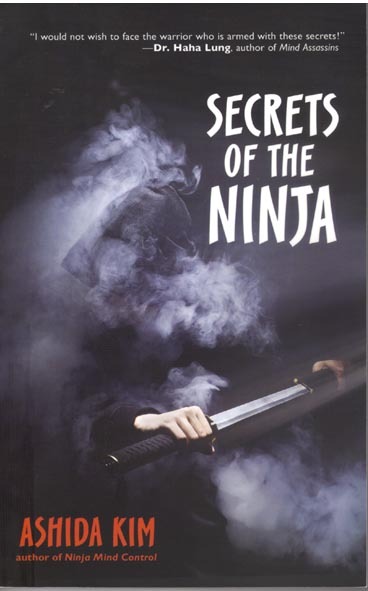 This version of Secrets of the Ninja has recently been released by so called legitimate publishers who have long taken advantage of Master Kim’s good name and kindness to rob him blind. We, his friends at DOJO Press, will no longer stand for it. Ashida Kim explains: “Many people think that Haha Lung and I are the same person. This is because all of his books are based on Ninja Mind Control, my best selling book for over thirty years. When I broke away from my former publishers because I caught them not paying me overseas and secondary rights royalties, they sought to capitalize on the market I had created for them. At first they didn’t want any martial arts books, and certainly not any as offbeat as mine. But, because they trusted me, I made them a fortune. To people like this, however, it is not enough to win, they must also cheat. They didn’t want to give me my fair share, even now they sell my books worldwide and laugh about how they stole from me. Doesn’t matter. What matters is empowering the people with Ninjitsu. Teaching them how to stand up for themselves and do the right thing. So, as long as the information reaches them, the money is not important. They can have their little part. So, they invented “Haha Lung.” This was intended as an insult to me because I had referred to the Black Dragon style as the Hai (can also be spelled Hei =“black”) Lung (Chinese for “dragon”) Ryu (school, style, or system). It is what is known in the publishing business as a “house name.” Meaning that several authors contribute to it or that it is turned over to whoever happens to be sitting at such and so’s desk this month. And, they have made a fortune selling those books by playing off the popularity of Ninja Mind Control. But, you can bet ol’ Haha is still just getting his measly $200 a week. He contacted me by e-mail a few years ago. Wanting to know if I would like to collaborate with him on some projects. I replied that I considered his publishers to be crooks and thieves and anyone who worked for them to also be a scoundrel. That I knew what he had done and considered it an insult and would be most happy to get in the ring and defend myself against his plagiarism. Never heard back from him. Most of his material is recycled NLP, Neuro-Linguistic-Programming, a pseudo-science of the late eighties. Ninja meditation is not about becoming a "mind-slayer." It is not about how to develop a cult or hypnotize someone into commiting murder. It is about learning to move in harmony with Nature, so that you do no wrong. NLP, on the other hand, is used as a tool by pseudo-intellectuals to make themselves feel smarter than “ordinary folk.” Most people have enough empathy to tell when a friend or even a stranger is in a bad mood. Most people are honest enough to say what they want and have their wishes respected by other equally enlightened human beings. What NLP, and by extension all of Haha Lung’s feldercarb, does is make the whole process into an elaborate game of cards where the players are constantly looking for “tells” to reveal what cards the other players are holding so they think they have some momentary advantage by virtue of this “secret” knowledge “stolen” from the victim. Much too complicated and unnecessary. Just look people in the eye and speak the truth. If you have a rapport with them, develop a friendship. But, don’t change what you are doing to please them or try to change what they are doing to please you. That is not your job and not one human being in a thousand is worthy to judge another. After all, who among us is without flaw? If you must manufacture a rapport with someone, you are cheating them and lying to yourself. Part of Haha's "mind assassin" method is knowing what the "tells" are so you don’t use them, that is “putting on a false face.” It is part of a larger psychosis of Denial. If you like yourself you have respect for others and no need to hide who you are from them or yourself. Role playing is fine for actors. For most people it is just easier to be who they are. That is the real purpose of Ninjitsu, to show you your tiger face. But, Haha Lung doesn’t know that, so he can’t teach it to you. All he can do is try to steal what I have freely given away. See how easy life can be when you aren’t constantly trying to cheat someone? In 2009, when I was inducted into the USMA Hall of Fame in Nashville TN, there was renewed interest in some of my books. One publisher, who holds “secondary rights” on some of my titles decided to re-issue Secrets of the Ninja. I was quite proud of this, even though under contract most of the money goes to the original publisher. My percentage under such sales is about .025% of the retail price. This edition is the original version, including mistakes that were not corrected by the original publisher. The same mistakes the secondary publisher chose also not to correct. Thus, the production costs them very little. Except for the cover. Don’t know who that chap is coming out of the smoke cloud with his sword, but it ain’t me. According to the credits inside, the picture is from an online stock photo service. Didn’t even shoot a new cover. But, they did put on the front “Ashida Kim-Author of Ninja Mind Control” and an endorsement from none other than Haha Lung himself. What makes this all the more interesting is that on the inside of the front cover are pictures of all his books for sale. So, instead of being a kind gesture to recognize my Hall of Fame induction or the fact that I have survived longer than any of my competition and am still going strong, this commercial edition is a cheap shill to promote Haha Lung by letting him ride the back of my success." We therefore ask all loyal fans and friends of Ashida Kim to boycott this book and to protest its sale wherever it may be found. For years we gave this book away for free on the Ashida Kim Homepage on a link called "Steal This Book-Everyone Else Has," that began: “First published in 1980, Secrets of the Ninja has been responsible for the financial success of three major "legitimate" publishing companies and their seventeen or so "front" companies -- dummy corporations that insulate them from prosecution for blatant copyright infringement that the FBI refuses to investigate or pursue, despite Federal Statutes charging them with the responsibility. These companies have grown quite fat robbing authors other than Ashida Kim and have done so with impunity, believing themselves invincible in court. Therefore, being Ninja, we shall not fight them in court. Instead, we will simply take away their source of income by giving away Secrets of the Ninja to anyone who wants it FREE OF CHARGE! Why pay these thieves and make them rich so they can rob others when you can have it for Free? We were working on revising Secrets of the Ninja when the publishers decided to have a go at releasing this one. Ours is better. In this edition we have corrected the Kuji Kiri section and added many pictures and techniques not in the original publication. Their book has 153 pages and 199 photographs. Ours is 235 pages with more than 250 photographs of Ashida Kim in action, some never before seen. To be a Ninja one must be strong, one must know, one must dare and one must be silent. A Ninja is a Hunter, who learns the ways of his prey so he can strike quickly and efficiently. A Ninja is a Warrior, who has learned to accept responsibility for his actions. The Ninja is a Mystic who can "stop the world" and "see with the eyes of God." 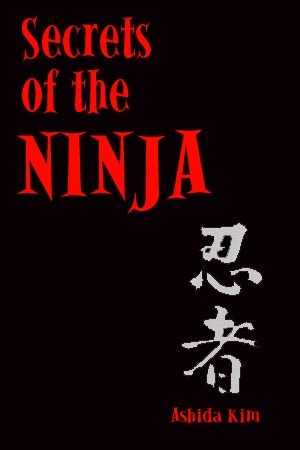 The Ninja are cloaked in mystery but are legendary for their missions of espionage, sabotage, and assassination in feudal Japan, which earned them a reputation as "invisible agents, ghost-soldiers, shadow-warriors, occult guards, and astral spies" of the highest order. The Ninja knows that even men of great power cannot change the world. Power can be achieved through Force, but lasting results can only be had through Love. Therefore, he seeks instead to move in harmony with the flow of the Universe, becoming one with his surroundings, hiding in full view of the enemy, practicing Ninjitsu, the Art of Invisibility. Ashida Kim is such a Ninja. Only he can teach you the secrets of this ancient Art.